For many centuries, the watchtower has stood below Farhin Falls, keeping guard over the river and the surrounding woods. A tower in a water fall, because why not? My project for the last few weeks, it was a real challenge to get everything to work, especially the water fall, which uses nets. It was fun to do some flat stonework again, after building so many round towers. And the rock work was just a bit of this and that. I also really don't like the head of the tower, but I wanted to try something new so here ya go, hope you enjoy and C&C needed. Wow! 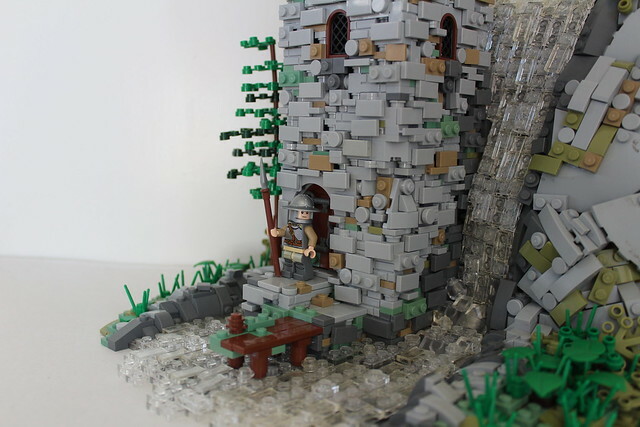 The curved bricks look natural here as rocks, and the way the waterfall comes down is lovely. Your rockwork is great, TM! I love the non-standard angles and curves that you have going on there. The wet rocks in dark bley is a nice touch, too. Your waterfall, better than most, captures the look and feel of falling water; the jumble at the bottom is the best part. The trans-clear as opposed to any blue hue is much more believable as highly-aerated water, though some white 1x1 round plates would have looked good as some foam in there as well. I like this texture better than most of the ones you have used in the past, actually; and unlike Titus, I like texture...This one has the appearance of being aged, in need of more mortar or chinking in the cracks, but still solid and firm, unlike so many of your towers that look ready to topple with a slight breeze. The roof looks good, but you are correct, there is something a bit off about the top. I think that perhaps the woodwork seems incomplete, or even a bit sloppy compared to the very intricate stone and rock you have going on here. Maybe it is the pre-fab window, or the general darkness of the wood compared to the lighter hues of the rest of the build. That being said, I think that this is one of your better works in terms of the texturing and scenery. Well done! So few comments? Just stopping by to tell you this MOC is amazing and deserves more attention. 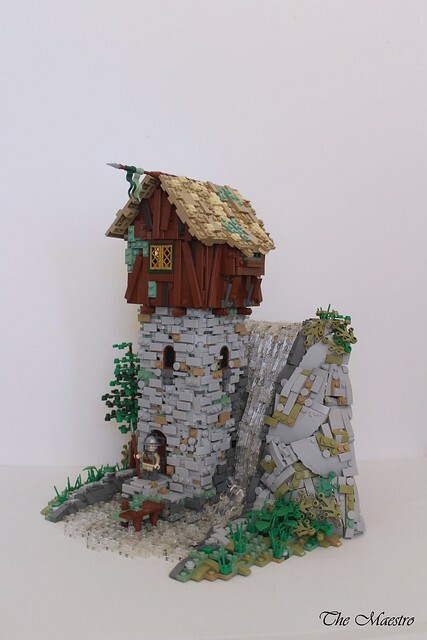 Probably the best waterfall I have ever seen in Lego. Wonderful work! Stunning waterfall! Very pretty tower as well, I rather like the wooden top myself. Though the section of moss on the left of it looks a little too busy with all the studs exposed and color contrast. Same down on the dock, I think fewer 1x2 sand green plates would look better. Looks amazing! The tower is nicely derelict and the top level looks very good as well, but the real winners are the waterfall and the rocks. Nicely organic, flowing look with a lot of textures on the rockwall. Just great! Thank you HQ, I believe you have hit the nail of the head when you say the darkness of the wood is off putting, looking at it again I completely agree. Wow thank you, I am glad you think so. I've always known you were crazy, but finally you've admitted it! Got ya! 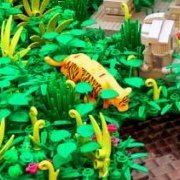 I see alot of influence from Legonardo in your style, and i will say you are doing him justice with your technique. Keep it up!